Our Natural Soap Sampler contains ten 1.5 ounce slices of our handmade Essential Oil Soaps. Essential oils are aromatic oils steam-distilled from the leaves, stems, and blossoms of plants and flowers. The 'essence' of each scent is then completely natural and includes no chemical additives or fragrances. Our Natural Soap Sampler includes one slice each of our Sweet Lemongrass Soap, Mountain Morning Wake Up Call (peppermint and thyme), Lavender Cream Goat Milk Soap, Patchouli Rose Geranium Cream, Spearmint-Lavender Goat Milk Soap (also sold as 'Hot Flash'), Orange Ylang Ylang Cream (sold as Free Spirit), Bergamot Mint Shea Butter Hand Repair, Eucalyptus Mint (also sold as 'Chicken Soup'), Lime Spearmint Goat Milk Soap, and Citrus Medley Goat Milk Soap. Each soap is individually wrapped separately from the others and labeled so that you, or whomever will be receiving your gift, will know exactly 'which soap is which' as you try each bar. The bars are then wrapped together in a colorful strip of fabric and enclosed again with a decorative cellophane bag and gold foil label. Each sample slice is approximately 1.5 ounces in weight. Minimum weight of this 10 slice Sampler is 15 ounces, or 5 bars of our regular size bath soap. We reserve the right to substitute a scent as necessary while still preserving the theme and intent of this Sampler - i.e. substituting with only other essential oil soaps. 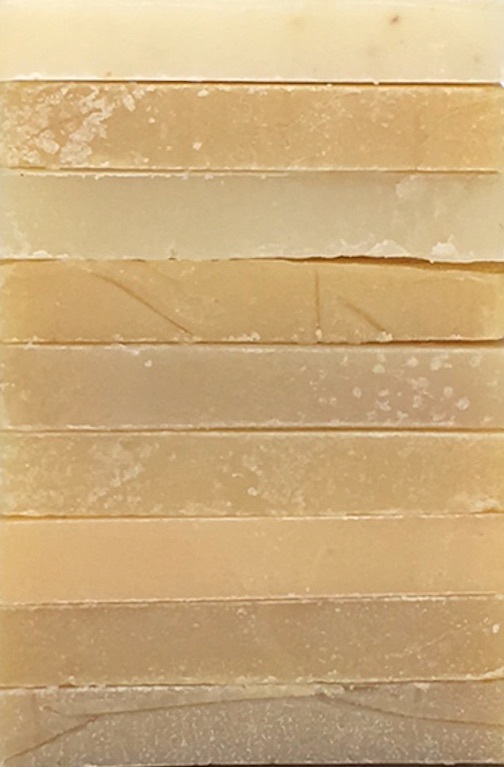 Natural Soaps in this Sampler will include Olive, Coconut, Palm and Castor Oils, Shea Butter, Cocoa Butter, lard, Sodium Hydroxide (Lye), Goat Milk, Mountain Spring Water, ground botanicals, natural essential oils.